Touch Disease happens quite a bit to the iPhone 6 and 6 Plus. The common symptoms of touch disease are a flickering grey box at the top of your screen, and a loss of touch response on your screen. These symptoms can often be brought on by twisting your iPhones frame slightly. Learn more by reading further, or if you think you might have touch disease, click the button below to get an estimate for a repair. In most cases I can repair your touch disease for less than $100 in about 3 to 5 hours. All touch disease repair is done right here in my shop, with no need to send your phone off for this repair. You get your phone back quick, for less money than any other shop in Columbia. Touch disease was identified shortly after the iPhone 6 and especially the iPhone 6 plus was released. People started noticing their iPhone 6 series phones would lose their touch sensitivity, and would sometimes display a flickering grey box at the top of the screen. Apple was slow to acknowledge this defect, often blaming the problem on user caused damage. It wasn’t until quite a few of these iPhones started turning up, that Apple stated that there was a problem during manufacture of these logic boards. 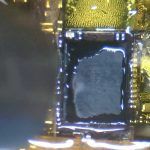 The problem was identified as a weak solder trace on the M1 solder pad underneath the Meson IC chip. Coupled with the flexibility of the iPhone 6 and 6 Plus frames, this created the perfect storm for this failure. You see the iPhone 6 and 6 Plus are very prone to bending, and this will put pressure on the chips on the logic board. When the frame flexes it would often tear the solder pad off of the logic board underneath the Meson IC chip. This was evident when you flex the frame of the iPhone and the problem would come and go. 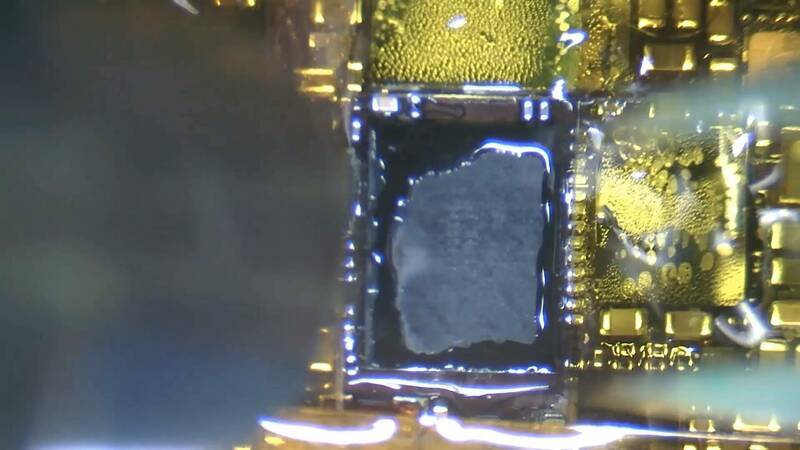 This was caused by the torn solder pad making a temporary connection as the frame was flexed and allowed the chip to make contact. Logic board repair specialists were quick to work on a repair for this, and now it is a common repair among logic board repair technicians. The repair for touch disease is pretty complicated so I will outline the basic steps below. We remove the screen from the phone and test the iPhone with a new screen to eliminate a faulty screen as the cause of the problem. If the problem persists we remove the logic board from the frame of the iPhone. After removing the tape covering the chips in question, we can get to work. I heat up the hot air station to around 390 degrees Celsius. Using the hot air gun I remove the Meson IC chip. 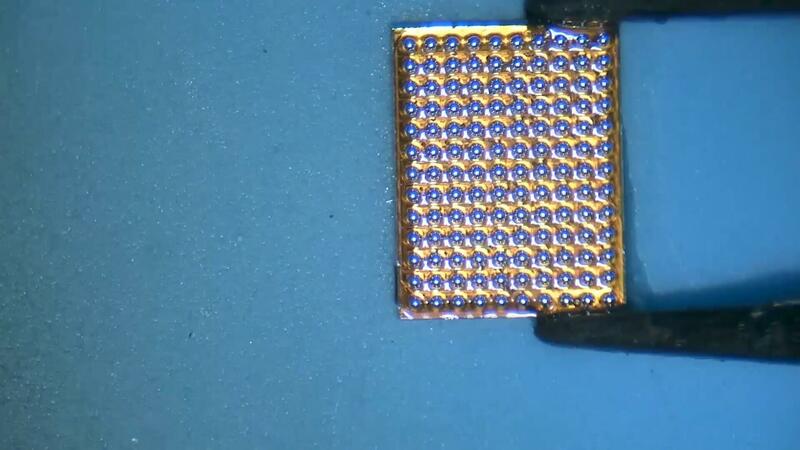 After removing the Meson IC chip, I inspect the area under the chip to look for any missing solder pads. In some cases there are none, and the area looks fine. 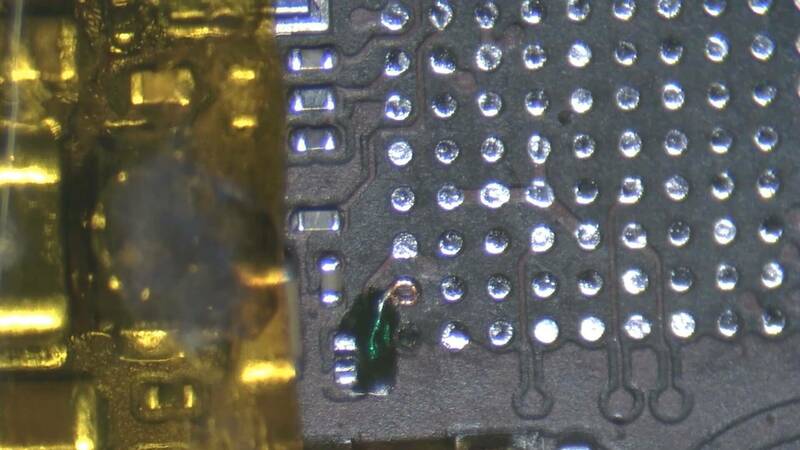 That does not mean that a weak solder pad isn’t at fault. 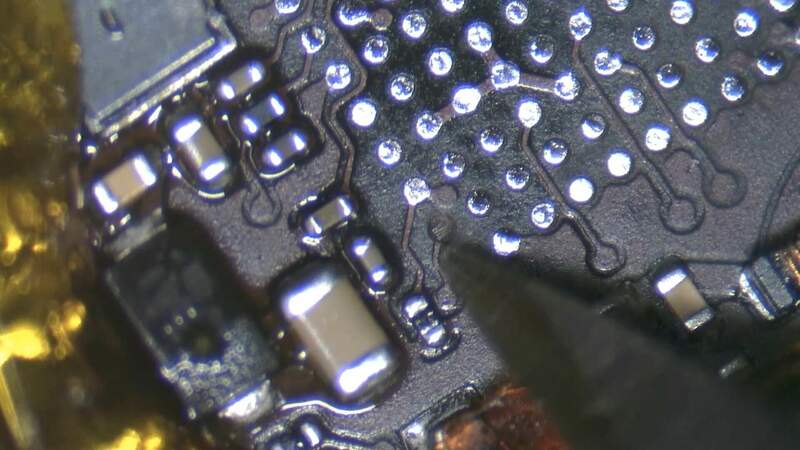 I then clean the unleaded solder off of the solder pads on the logic board. Unleaded solder melts at a higher temperature the leaded solder, and leaded solder is easier to work with. 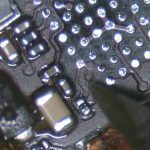 It is during this step that any weak solder pads will usually come off. If they do I will run a jumper wire to replace the broken or missing solder pad on the logic board. This is a time consuming step but it ensures that the repair logic board will function as intended. After the solder is removed and any jumper wires are run, I reball the Meson IC chip with leaded solder and clean it up. 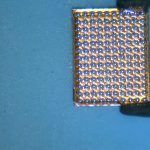 Reballing is the process of removing the unleaded solder from the underside of the IC chip and using a stencil to replace the solder balls with new solder. With the chip reballed, and the logic board repaired and cleaned. I move on to replacing the Meson IC chip, back on the logic board. This is done by putting the reballed chip in position as close as I can get it, and then heating the area to around 300 to 325 degrees Celsius. 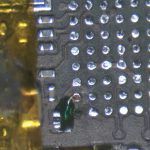 As the logic board and the chip heat up and the solder liquefies, the chip is pulled into position. After the chip settles, I give it a slight nudge to make sure all the solder has liquefied, and then I let the logic board cool off. After the logic board has cooled off, it is cleaned and the tape covering the work area is replaced. Then the logic board is put back into the frame, and re-tested. My initial test for this repair is to plug the digitizer and LCD into the logic board, and turn the phone on. After I get to the home screen, I press on the logic board around the display connectors, and test to see if I lose touch sensitivity, while I am pressing the logic board. If the touch works well during this test, I put the phone back together. After the phone is put back together, it is tested once again to make sure that the touch works properly, and that there is no signs of a flickering grey box, while the frame is slightly twisted. If all goes well, the customer is called, and they come and pick their iPhone up. This repair is pretty unique in that chips are being removed, and jumper wires run. 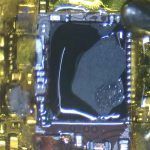 Very few iPhone repair stores will attempt this repair, and usually only logic board repair techs are confident enough to attempt it. Most iPhone repair stores in Columbia, will contract this work out to another repair shop. If that is the case they will mail your iPhone off for the repair, and you should get it back in a week or two. That is not the case at Hotshot Repair. I have been trained in logic board repair and have done quite a few touch disease repairs. This repair usually costs around $75 to $95, and typically takes anywhere from 2 to 5 hours or so. If you think you may be dealing with touch disease, give me a call or send me an email.